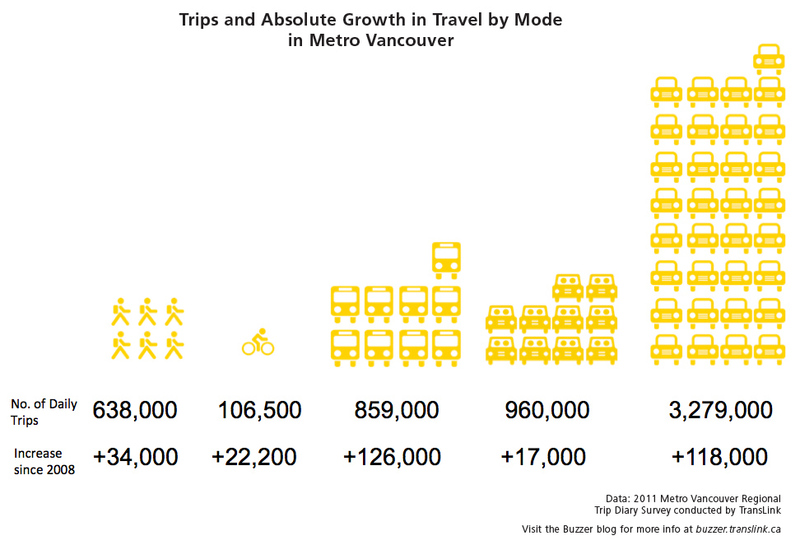 I expect to see these graphics reproduced a lot, but they capture the main message – transit is up, car trips are too but by less than population, and those cars are shared less often. Of course, its not good enough and if the current funding mess isn’t sorted out, it is going to get worse. I am taking some time off, so I do not have a lot to add at the moment, but the comments are open. The inaugural meeting of the World Symposium on Transport and Land Use Research (WSTLUR) was held in Whistler, British Columbia, July 28–30, 2011. The conference brought together academics and practitioners at the intersection of economics, planning, and engineering in the fields of transport and land use. In addition to presentations based on rigorously peer-reviewed papers, the conference included a plenary presentation from Ed Glaeser, the Fred and Eleanor Glimp Professor of Economics with the Department of Economics, Harvard University, and author of the book Triumph of the City. Though what appears to have prompted the story is the complaint of the bus driver’s Union that their members are tired of pushing the button that counts those who refuse to pay. after a Twitter follower rightly asked how much fares have risen over the same period. The recent provincial audit of TransLink found fare evasion across the entire system rose 120 per cent from an estimated $6.6 million in losses in 2001 to $14.5 million last year. That’s less dramatic than it sounds – factor in a 21 per cent increase in ridership and a 65 per cent fare price increase since 2001 and losses should account for more than $13 million by now if the same proportion of riders cheat. The story directs attention to the evasion that will not be stopped by the new faregates on SkyTrain. And there is also the suggestion – rebutted by Gordon Price and Peter Ladner – that somehow loss of money due to fare evasion is a reason not give Translink any more from taxes. Transit revenues (mainly fares) were $78m but that was also the year of the strike – so 35% less than budgeted. So not really surprisingly, the amount lost to fare evasion in that year would also be well down – as no transit was running for four months! What really needs to be compared is the rate of fare evasion. 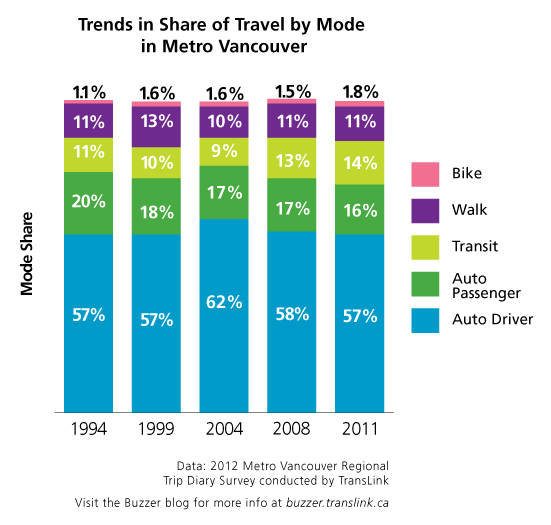 In 2001 it was around 8.1% of transit revenue. In 2011 transit revenue was $444.7m (source: 2011 Year End Financial and Performance report) $433m coming from fares – so the rate of loss was 3.3% of fare revenue (3.2% of transit revenue). Actually, there was some work done on fare evasion around that time, by KPMG and in a report in 2002 they estimated fare evasion at $6.7m or 3.9% – but conceded that the lack of data on buses meant that it could have been 4%, or $1.4m more. Indeed 4% is one of those easy to remember figures that is still in my head, and I am glad that I have now got the source for that. So the headline does seem to be misleading. Forget the use of 2001 as a base year, since clearly things were not “normal” then, and look at the long term trend and it seems to me that the best estimate we have of Translink is that the rate of fare evasion has been reduced – from around 4% to something closer to 3%, And that is before the new measures to improve collection on fines had been implemented. The faregates are expected to reduce fare evasion by $7.1m a year (source Business Case summary) so roughly half of what is now thought to be lost. But after all, it must be remembered that all of this is based on estimates. The whole button pushing business (“refused to pay”) does not begin to measure fare evasion. How many people simply waved a pass at the bus operator – but were not actually entitled to use that pass? How many people decided to pay a concession fare when they should have paid full adult fare? How many had a ticket for a shorter journey than the one they actually made? After all, if you stop someone, inspect their ticket and ask them where they got on, you cannot really expect all of them to be completely honest. If we had really good data on travel around the region in general, then maybe we would have a better idea of that the revenues ought to be – but even then that usually relies on self completion surveys. Do the sort of people who are responsible for consistently defrauding the fare system answer such surveys – and would we believe them if they did? This blog post has been corrected from what was originally posted. By the way, I do want to place on record here my real appreciation of some very good work done by Translink on their website. The search function on the Document Library has been greatly improved, and this morning I was finding what I was looking for really quickly. This may have been implemented some time ago, and I missed it, for I have been avoiding going into the archives – but this story required it. Thank you. Instead of giving you a link to one of the mainstream media stories this one takes you to the BC Government “Newsroom”. This both avoids the problems of media paywalls and the idea that the media are responsible for the “spin” in news coverage. This press release and its supporting “backgrounders” have all the spin. For those of you who are new to this (is there anyone who fits that description?) Translink, the Region’s Mayors and the province have been arguing about how to pay for much needed transit expansion in the region. In fact this discussion has been going on for many years – at least the last 20 years, probably longer. Vancouver and its suburbs constitutes the only major metropolitan area in BC. There really is no other major city. 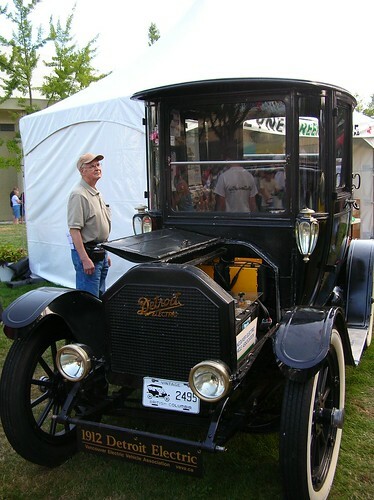 Its needs are therefore different to places like Kelowna or Kamloops. It is not just a matter of scale, its a different kind of place, with a different kind of economy and quite different patterns of movement. The growth of population alone poses a challenge – but at the same time most of the region is the typical large North America suburban agglomeration. “Zurich surrounded by Phoenix”. A day after I wrote this post the Georgia Straight posted this video. 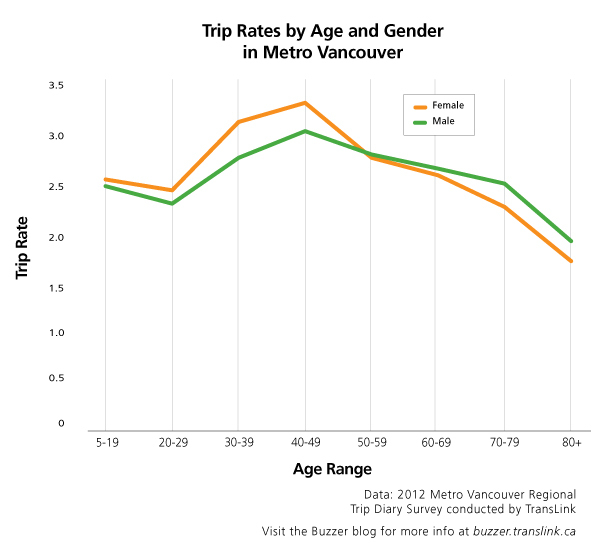 It shows “one weekday (from 4am to 4am) of transit activity in Metro Vancouver, based on the General Transit Feed Specification (GTFS) data made available by Translink”. 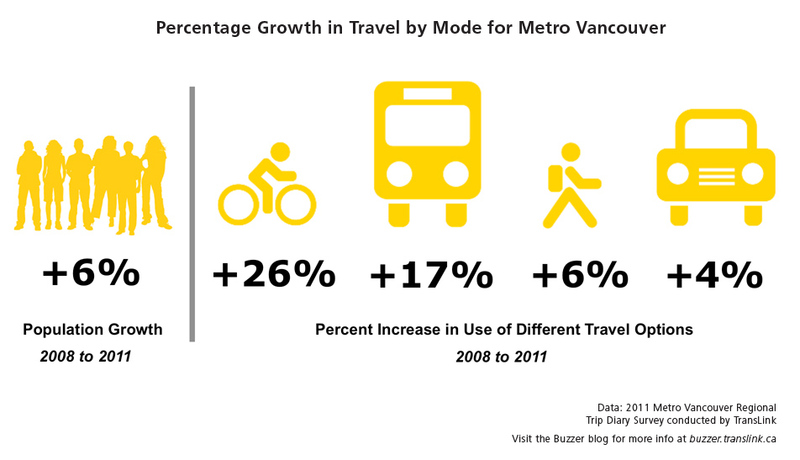 See what a good system there is in Vancouver – and how thinly stretched it gets south of the Fraser. I have inserted it since it nicely complements the point made above. There is a unique arrangement to run and pay for transit here. Half of the non fare revenues are supposed to come from a provincially collected regional gas tax – but changing travel patterns (in part due to higher gas prices) have not only increased transit use but also reduced transportation fuel sales. Oddly enough, there is plenty of federal government supplied gas tax revenue – but that can only be spent on capital projects and has to be matched by both province and region, so much remains unspent. At the same time, a fare concession to post secondary students has boosted demand and thus increased operating cost – which turned out be more important than the “revenue neutral” formula its price is based on. Translink has thus had to put much of its agreed long term plan on hold. It has cut service in order to shift resources around the system to the parts that are overcrowded. At the behest of the province and provincially appointed Commissioner it has sought – and found “savings” all over the place. Meanwhile the region’s Mayors and the provincial Minister of Transport have argued about new sources of funding. The province has always maintained that property tax could be increased – because that is what the Mayors control. The Mayors say, quite reasonably, that property tax has little relationship to transit spending and that they only get 8% of all taxes levied on households – but voters in municipal elections hate property tax increases. And anyway Translink has had other potential sources of revenue provided for in provincial legislation – like a vehicle levy – which the province refuses to collect. While the previous Minister promised to consider another funding source, this was conditional on a “temporary” property tax increase while it could be formulated, consulted on and then implemented. Then the prvince reneged on that agreement and the Mayors threatened to rescind the property tax increase. If they do that, Translink will have to cut service even further. So the present Minister has been saying that she cannot even discuss a new funding source until an audit has been conducted – ignoring all the previous audits and studies. Now that audit has been completed – and it turns out that she has already been sharing its results with Translink, and many of its proposals have already been implemented. So despite the claim that “significant savings” have been found they only amount to $41m – compared to the $98m already identified. And anyway are nowhere near enough – “still not enough to meet the future transit expansion needs of Metro Vancouver.” So basically the point of the audit was to delay and prevaricate. And the “next steps” are to delay and prevaricate some more. Once the long-term regional vision has been developed, the mayors and TransLink will be in a position to go back to the public to discuss cost and how to pay for it. The only word I can use for this is “chutzpah” . There has been a long term regional vision for as long as I have been here. The province simply decided to override it. There was going to be a compact urban area, with complete communities which protected the green zone and increased transportation choice. Instead of that a series major highway expansions is increasing sprawl, destroying the green zone and ensuring continued car dependence for the majority of the region. 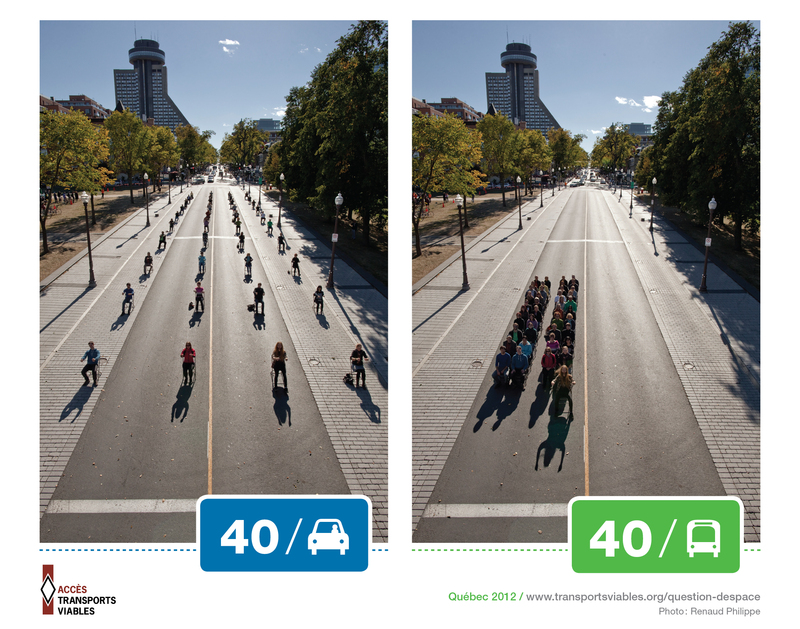 “Transportation choice” for three quarters of the population is Hobson’s choice. Government needs a clear sense of the regional vision and priorities over the coming decades, what kind of transportation system will be needed in the future and how much residents are prepared to pay for it. A practical discussion can then be held about possible funding tools. In other words, we can put this off until after the election which has to be held in May 2013, which we are almost certainly going to lose, and then its someone else’s problem. In the meantime, the staff at Translink and the Mayors will take the heat for the increasing inconvenience and disruption on a transit system that is unable to meet the demands placed on it. One of the reasons this blog post did not appear yesterday is I then took all this seriously and actually read it. It is a complete waste of time. The only “savings” are further service cuts. The province has always wanted more property tax for transit in Vancouver. That is the reason why I wrote those paragraphs of introduction. 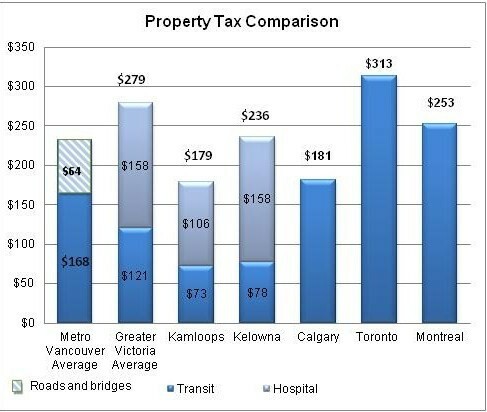 What this graphic does is pretend that somehow residents of Greater Vancouver pay less in taxes for their transit than they do in Toronto, Montreal or even Victoria. Of course there is no mention of the Translink gas tax – that is only collected in Greater Vancouver (by the province, as I pointed out). Nor the hydro levy, come to that. And the fact that “roads and bridges” were all downloaded onto the municipalities – and the gas tax was originally offered as a way of putting pressure on to them to sign up to Translink. They were going to get them downloaded anyway – so they might as well get on board with the provincial government’s proposed regional transportation authority if they want some new funds to help pay for that. If the Mayor’s refuse to implement the property tax increase, then some of the province’s preferred schemes cannot proceed – such as the (much reduced) rapid bus over the new Port Mann Bridge. chose to spend on highway expansions instead. We are stuck with the widened Highway #1, the South Fraser Perimeter Road and the widened Sea to Sky Highway. All of these are already contributing to an ever wider spread of suburban sprawl. “Expertise in land-use planning” has never been in short supply. We have had lots of regional plans and all our Official Community Plans have been crafted to fit into that framework – and much good has it done us (that’s irony, by the way). Port Moody, for instance, built a whole city centre around the idea of Transit Oriented Development. The Evergreen Line will now be built, many years after that development was halted, due to lack of transit service. Surrey has been asking for light rapid transit for years – and it might see a truncated BRT, if the other Mayors swallow their indignation at being treated so shabbily. I also wonder about the timing of the release. After all, there was another event last night that was guaranteed to fill up the front pages and keep the political pundits occupied. Maybe they thought no-one would notice. I wrote about the local opposition to the new outlet mall at the airport in July. More information is now available from the Globe and Mail which explains more about the proposal. Dump trucks have been moving sand at the site at the junction of Gilbert Road and Russ Baker Way since that post appeared. The Globe is going behind a paywall next week so the story may no longer be available. Apparently, links will still work if they come from Twitter – presumably from the Globe’s feed – so it will not be the end of stories from that source. But in the same way that I no longer scan the Sun for stories, I will now have to rely on secondary sources.